Jarte is capable of printing mirrored page margins and mirrored header/footer lines when performing double sided printing (i.e., using a duplex printer to print on both sides of each page). 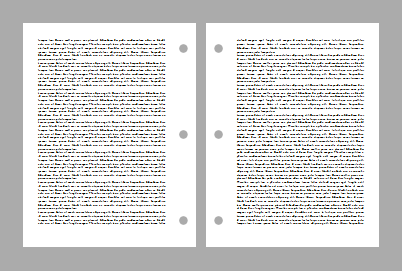 Mirroring page margins is the practice of swapping the left and right margins on the evenly numbered pages of the printout. Similarly, mirroring the header and footer lines is the practice of swapping left and right header/footer elements on the evenly numbered pages. See Advanced Settings for details on how to find and change the value of a Jarte advanced setting. Copyright © 2001-2011 Carolina Road Software L.L.C. All rights reserved.